A recent article in The Guardian by David Cox claims that “[b]y gently mocking its patriotic heritage, [Joe Johnston’s new film] Captain America: The First Avenger turns US adventurism into an endearing myth,” thereby sapping it of its deeply dangerous real-life effect. This inspired me to think a little bit more deeply about the flag clad heroes of Joe Johnston’s newest film and, to a lesser extent re-visit his 1991 film The Rocketeer. Cox raises a concern about the appropriateness of “red-blooded American heroes, intent on slaughtering lesser folk to impose America’s will” overseas. For Cox this serves as a launch pad for a discussion of the various tweaks that Hollywood has made in order to maximize the appeal of franchises such as Superman, G.I. Joe, and now Captain America to an audience that looks less kindly on American interventionism. Cox begins with the assumption that the rest of the world loathes America, and yet he is primarily interested in how Hollywood studios have still managed to wrench millions of dollars from foreign audiences in developing countries: an entirely different kind of imposition of American will, in the name of the almighty dollar. I’m not particularly interested in the changes to titles and such. They are largely cosmetic, and anyone watching The First Avenger – as it’s titled in Russia, Ukraine, and South Korea – knows that the film’s hero is American. But is Cox’s assumption correct, that the easy questioning and mocking of Captain America’s patriotic origins in the film only serves to further the myth of American exceptionalism and make it “impregnable to protest”? It seems this raises “a damned if you do, damned if you don’t”, or better yet, “don’t make the movie” situation that a lot of critics take toward superhero films today. This seems to be Cox’s take, as his column’s purpose is to purportedly uncover the “agendas” behind today’s movies. He’s not alone in believing that superheroes only serve to support the status quo and forward a conservative agenda. My glib take is that Marvel’s only agenda is to make money. But as I recognize the very real consequences of militarism, colonialism, and imperialism, I’d be loath to support something that is in fact promoting a vile agenda. But looking closer at Captain America: The First Avenger outside the “film current” and post-War on Terror outrage at American military adventurism, and rather treating it as a piece with the history of the comic book stories and director Johnston’s early superhero adventure, The Rocketeer, might give a different perspective on both nationalism and American myth-making. Does Johnston’s film have anything constructive to say about patriotism and the value of the nation or is the only myth it serves one of dominance and hegemony? One of the odd things about Cox’s argument is that it seems to take for granted that Captain America and Superman (the less said about G.I. Joe the better, since I’m not familiar with the cartoon or the movie) are “intent on slaughtering lesser folk.” This is a highly dubious premise, let alone that these heroes are enforcing American political will. Both in the comic books and in the films, these characters are more mythic archetypes and often stand at cross-purposes to those who would impose injustice on anyone, under any flag. Frank Miller played with the idea of Superman as Reagan’s lapdog in hislandmark The Dark Knight Returns (1986), but at the cost of stripping him of his Clark Kent persona and anything else that makes Superman an interesting individual. While Captain America certainly got his start punching Nazi’s in the jaw (as he does in the U.S. War bond cabaret in the film), recent comic storylines have had Steve Rogers stand in open conflict with a U.S. government for enforcing a superhero registration act. As he says in the Civil War storyline: “While I love my country, I don’t trust many politicians. Not when they’re having their strings pulled by corporate donors. And not when they’re willing to trade freedom for security.” Hardly the thoughts of a jackboot for American hegemony. While it’s understandable to have concerns about the papering over of actual crimes committed by governments, it seems to miss both the actual content of the films but also the value of myths and the work they do in shaping our conception of (to borrow the term from Benedict Anderson) the “imagined” community of the nation. The work and writing of alternatives to the dominant narratives of history, such as Howard Zinn’s magnificent A People’s History of the United States, that uncover the shameful past don’t merely serve to point fingers but to spur us to further action. Works like Captain America instead serve as valuable alternate histories, reminding us of the possibilities of national pride and service. They are less concerned with the reality, but the potential that remains at the heart of the idea, or imagining, of the nation. While such mythologizing can and does serve to de-historicize the past, such mythologies serve a function in all societies. So, what function do the patriotic superheroes of Joe Johnston’s films serve? In Johnston’s Captain America, Steve Rogers is reminded that he was chosen because, not inspite, of his weak physical frame. Because he was once weak, and it is the weak that remember that force creates bullies, it is hoped that he won’t let his power change his internal characteristics. He remains an inclusive defender of the weak. When the military refuses to go after his M.I.A. friend, Bucky, he goes against orders and risks himself for others. This is not adventurism, but self-sacrifice. 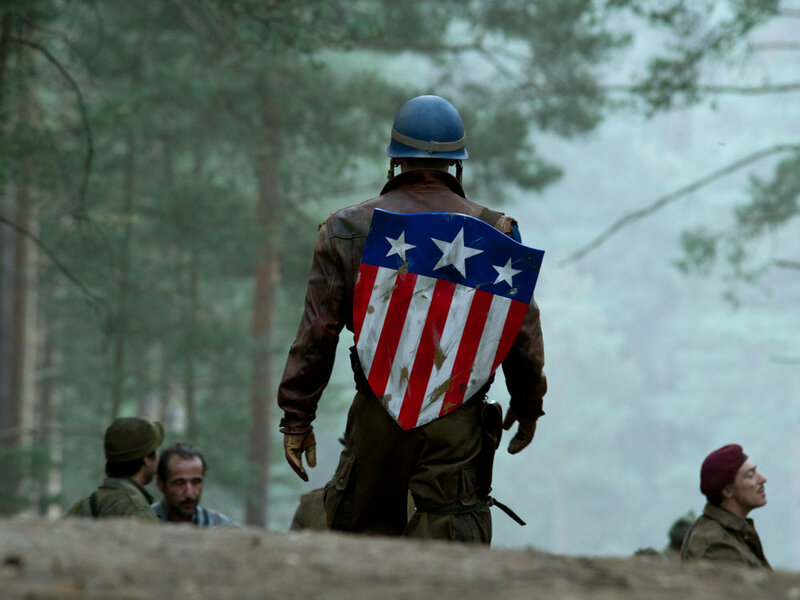 Rogers’ formation of a team of commandos to help him continue the fight against Red Skull outlines how different he and his mortal enemy are, and subtly reinforces the vision of America that Johnston forwards in his films. Dum Dum Dugan, Gabe Jones, and Jim Morita are drawn from various places and ethnicities that make up America (Bostonian, African-American, Japanese-American), not some kind of uniform super-race. While some might say that a character like Jim Morita only distracts from the fact of Japanese-American internment camps, his inclusion in the Howling Commandos serves to re-build the of Japanese-American identity as important to the nation, rather than serve as another reminder of their humiliation. (This is also in nice contrast to the portrayal of Asians as monstrous in actual Golden Age comic books and reminds us that comic books are not monolithic and are rather dynamic). The fact that Rogers treats these men as peers also shows that he considers himself one of them, not as an especially chosen “superman” to lead only “the best” that America has to offer. It is a privilege and an honour that he has his enhanced abilities. Not a right. Johnston seems to preserve that important aspect in his films, and allows for the possibility that nation could be a force to inspire, rather than conquer. Johnston’s The Rocketeer first gave us a glimpse of his update to a classic vision of America. While not explicitly a nationalistic hero, Billy Cambell’s Cliff Secord does find himself draped in an American flag at the climax before blasting off to do battle against the Nazi’s. Secord also finds himself at odds with the U.S. government, because of his possession of a top-secret rocketpack (built by none other than Howard Hughes, played in the film by a pre-LOST Terry O’Quinn). Hughes presentation to Secord shows that the Nazi’s plan is once again an elimination of difference. The wonderfully chilling recreation of a Nazi propaganda animation showing jetpacked warriors burning the Capitol Building and spreading across the earth is wonderfully re-evoked in Red Skull’s Hydra commandos. The Nazi attack on America and the world in the films brings together people from many different walks of life. In one memorable moment, the Italian-American mobster Eddie Valentine (Paul Sorvino) turns to his employer, the actor Neville Sinclair (a delightful Timothy Dalton) after it is revealed he is a Nazi, saying: “I may not make an honest buck, but I’m one-hundred percent American.” In The Rocketeer, even those who share differences in moral and economic opinion can agree that there is something worth fighting for in what is one’s own. It’s not a take-down of others, or a holding of America above all, but a recognition that one’s home is special and not to be abandoned to a madman’s dreams. Perhaps the danger is that Captain America, as opposed to someone like The Rocketeer or Superman, does his adventuring in the specific name of his nation state, and there is some question of whether nationalism is ever beneficial. The nation as an entity is always fraught with danger because it is formed upon an idea, rather than a base essentialism that remains unchanging. It is what Benedict Anderson calls an “imagined community.” However, in the film Cap must reject the false nationalism that is gently mocked, and stand up and act. He traces the outlines of an imagined community and helps us to imagine an America that actually behaves the way it says it believes. Rather than reinforcing the status quo, such myths help us to imagine the possibilities for transcending it. My suggestion is that contrary to the so-called pragmatism of many neo-conseratives, a character like Captain America is rather a progressive, shaping our notion of what America can be, regardless of whether it ever actually has been. Under such terms a real-life Captain America would be someone like Matt Damon’s Officer Miller in Paul Greengrass’s Green Zone (2010): a character who remains a patriot while willing to confront the unpleasant ills of the country he serves and offer a dynamic path forward through action. It embodies a very Zinnean notion that we must confront our own misdeeds before we can reshape ourselves into something better (not suprising given Matt Damon’s professed admiration for family-friend Zinn’s writing). In the end the myth of Captain America serves not to gloss over past evils as harmless adventurism, but rather as a reminder of the ideals that a nation was founded on – and which, regardless of whether they have lived up to them still can.